Hooray for the long weekend! Sunshine, good company, cold drinks, being on the water...who else is excited for the start of the summer season? 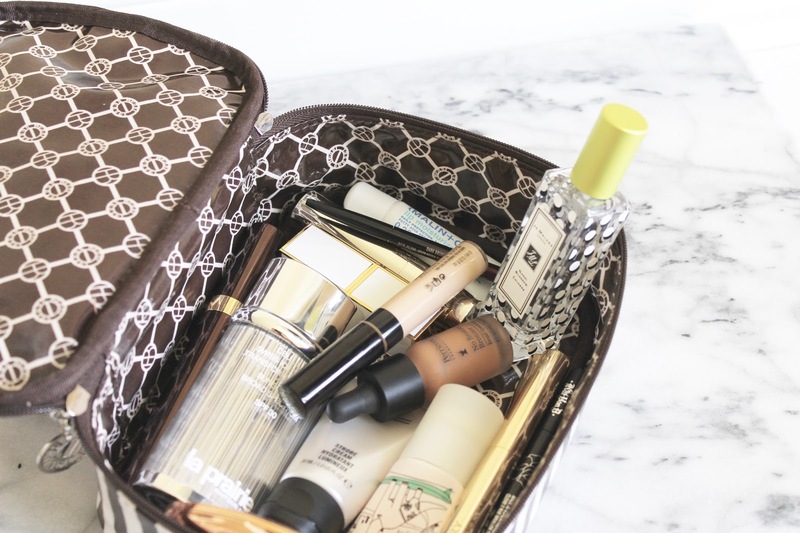 In the spirit of enjoying the weekend in the most carefree style possible, I packed my makeup bag with essentials for doing just that. These are my go-to fuss-free, mostly cream-based products that can be slapped on and forgotten about while I'm out enjoying the weather and time off. I'm going to be spending some time with my family and friends on the lake and since I'll be mostly outside or on the boat these types of products (SPF included) will help perk things up quickly and comfortably. Hope you all enjoy the weekend! For Base - I've managed to keep things unfussy (somehow; I'm actually patting myself on the back for this one) and I'm chalking it up to just how good this La Prairie Cellular Swiss Ice Crystal Transforming Cream is. I've done a full post here, and yes, it's super pricey, but basically it's a skin perfecting tinted fluid cream and sun protection in one. It uses that ever-so-famous caviar technology that the brand is famous for to help protect and brighten the skin, while giving the skin a plumped and smooth look instantly. It's not greasy at all, and once it meshes into the skin it has a skin-like satin matte finish which I love. But enough on that, I've also been getting on really well with a new concealer. Ooh...I know, I've put down my Nars for something else, shocker. 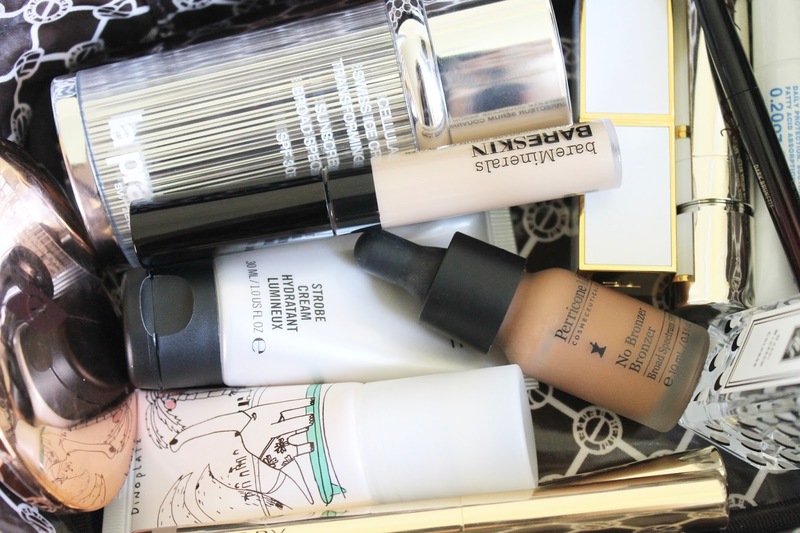 The bareMinerals Bareskin Concealer is ahh-mazing. It's high coverage, but since it's a "serum" consistency so it's fluid and moisturizing enough to blend without creasing, but it sets and doesn't slip and slide around either. I use the shade Light and it works for both dark circles and blemishes, so bonus points there. To keep t-zone shine at bay, I'll be using my Charlotte Tilbury Airbrush Flawless Finish Powder, which I've hit pan on. Need I say more? 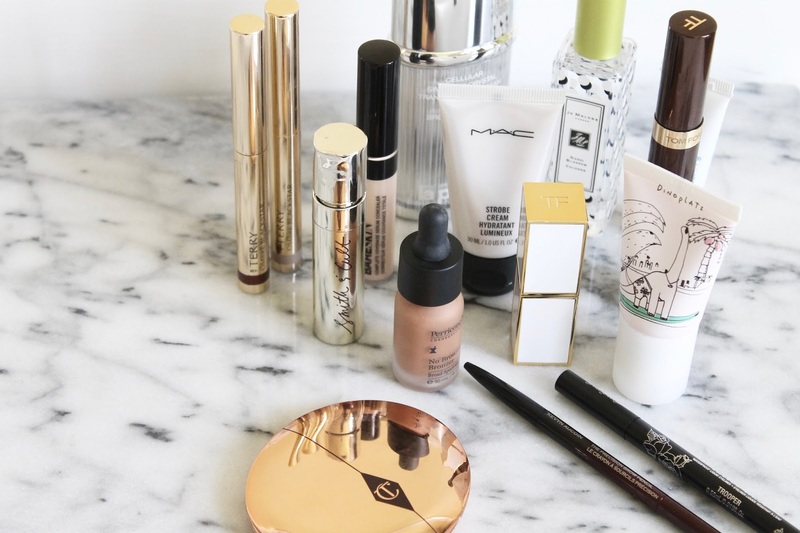 For Cheeks - For a bit of an extra, but completely non-greasy, glow I've got MAC Strobe Cream by my side. I find just a small dab of this gives me a lit-from-within radiance without a single speck of shimmer. I'm into cream based products for low-key weekends so this is all the highlight I need. For blush I'm all about bouncing the Too Cool For School Dinoplatz Cushy Blusher in Surf's Up onto my cheeks and going. It's got a cushion applicator that deposits a soft, hydrating, sheer liquid blush in an ethereal baby pink color. It's an instant complexion pick-me-up that brings such light to the face and looks so natural. I'm obsessed. Keeping with the liquids and creams theme, I'm also bringing the Perricone MD No Bronzer Bronzer to add a bit of a bronze goddess glow, even though I'm really super pale. This helps me fool everyone, so it's a keeper. For Eyes - It's all about the cream shadow sticks here. I'm bringing my all time favorite formula for it's staying power and beautiful colors, the By Terry Ombre Blackstar in the shades Bronze Moon and Ombre Mercure. I've also tossed in my trusty Kat Von D Tattoo Liner in Trooper because I'm attached to it and always like to have it with me in case I'm in the mood for a winged liner. I'm telling you, 8/10 times I am! And of course, my Tom Ford Extreme Mascara, which is definitely on it's last leg. It's been well loved though and it's one of those formulas that seems to have gotten better the longer I've had it for. I thought I would get one last weekend use out of it and then say my final goodbye. For Brows - I've recently been trying something new in the brow department, and am excited to report that it's a definite winner. It's the teeny tiny Kevyn Aucoin The Precision Brow Pencil in Dark Brunette and it creates the perfect hair-like strokes, comes with a spoolie, and has no red undertones whatsoever. It's literally a perfect ten product. For Lips - Malin + Goetz Lip Moisturizer is amazing for everyday lip moisturizing; but I'm also bringing my new favorite lip stain - Smith & Cult The Tainted Lip Stain in Sweet Suite. It's a balm stain hybrid that feels so hydrating and comfortable on the lips, but still leaves behind a stain once the shine wears off. It's amazing. I'm also bringing the Tom Ford Ultra Rich Lip Color in Aphrodite for night. It's a beautiful blue-based pink that really brightens up my complexion, and I love that it can also be dabbed into lips for a less notice-me stain. For Spritzing - Jo Malone Nashi Blossom Cologne. Full review here. What will you be packing for your weekend away?